We visited Chang Tion village by driving 15km from Puding to the landing stage on the Ye Lang Hu Reservoir and then going by boat for around half an hour. We then scrambled up the steep sides of the reservoir to the village. We were led to the village by two sisters who were originally from the village. 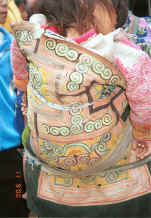 Although the village was reputedly originally a White Miao village 'the main colour of the skirt had been white 100 years ago', one sister wore a Side Comb Miao costume and the other one clothing which looked more like Red Hat Miao. The village was obviously very poor and many of the clothes were torn and worn. Some of the houses still had thatched roofs with wattle and daub walls although others were of stone with slate roofs. There were a small number of women dressed in their festival clothes in honour of our visit. They brought out to show us an old loom which had been in use for more than 100 years. The time for weaving would be after the harvest. One woman was wearing a black hemp skirt and another was wearing one woven of ramie. The village mainly grew ramie. One woman went and cut twigs of ramie and demonstrated stripping the fibre from underneath the bark with a bamboo scraper. They then demonstrated splitting and splicing the ramie fibre.